Hello fanciful people! Welcome to the first installment of Tasty Tuesday! Be excited. Very excited. We hope you find Tasty Tuesday, well, tasty I guess. Today’s post is a little more budget related when thinking about tasty food but on any given week you might find an idea for a snack you can’t resist, a look into a new diet, recipes for an easy dinner or even tasty entertainment ideas--you know we love to entertain. We might even feature one of our favorite restaurants a time or two. Without further adieu, our first Tasty Tuesday! Usually at about 11:15 hunger pains ensue and you would think I am about to die. Ravenous tendencies begin to emerge and I have to remind myself that in only 45 minutes I can enjoy a “tasty” lunch. Or, what usually happens, I grab a handful of almonds or inhale half of a granola bar. During any given week I (and I think I can speak for Laurie as well) consume four, but usually, five homemade lunches. Don’t I enjoy getting out of the office or away from my desk? Of course I do! And most times I will at least bring a magazine to get my mind off of work, drive to a park and eat in my car if the weather isn’t cooperating or find a picnic table and soak in some fresh air. Even more than going out for lunch I enjoy what could be up to 1,000 extra dollars a year for brown bagging. $1,000 people! According to an August 2012 ABC News blog post and an Accounting Principles survey, the average American usually spends up to $46.50 a week on lunch! Think of the all the things you could do with an extra $1,000 a year. The average brown bag lunch is usually never over $5.00 and is most often less than that amount. That cuts your cost for lunch in half as opposed to eating out every day. In half people. Ok, now you have seen the $’s and are willing to use a little time every day to enjoy a homemade lunch what is on the menu right? You hate peanut butter and jelly and ham sandwiches. Ok. I get that. They aren’t my favorite either. What do I eat? I was so hoping you would ask. I am more than willing to share my lunch secrets. One of my secrets is that I often buy a number of items that can interchange for multiple different types of lunches. For instance I buy sweet peppers (bonus, high in vitamins) that will be fantastic in salads and on wraps. Or I might buy spinach that can be the star of or added to any salads, soups or sandwiches. Multi-use items allow for more creative lunches that won't leave you craving that deli down the street. Other options are cooking a little more food on the weekend or the night before and use leftovers to build your lunch. Say you have grilled chicken, steamed veggies and mashed potatoes. Maybe leave the potatoes at home to steer away the afternoon slump and stay pepped up on the protein and veggies. Add your chicken to some salad or throw it in a wrap and have the veggies as a healthy side.This might be an example straight from my house.... Grilling season has begun! 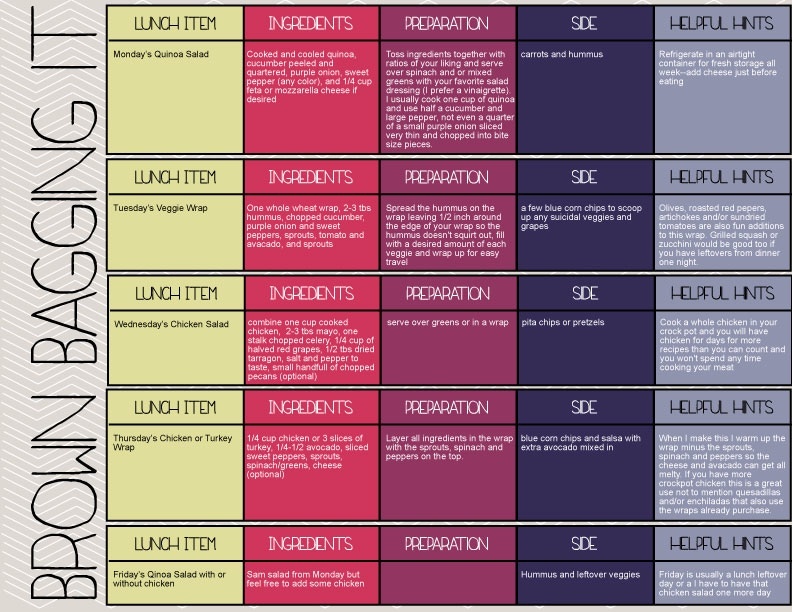 Here is a week of “tasty” lunch ideas if you are needing some inspiration.